You've heard of the National Three Peaks - Now take on the Welsh equivalent. 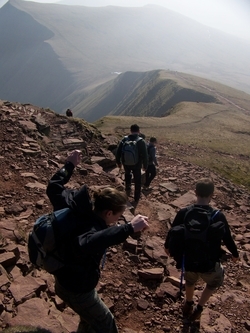 Pen y Fan - Cadair Idris - Snowdon and all in 24 hours. These three great mountains will test you to the limits. Get ready for an epic day sampling these three great Welsh mountainous regions!! Starting in the beautiful Brecon Beacons your first challenge is to scale the sandstone peak of Pen y Fan standing at 886 metres. This is followed 3 hours later by Cadair Idris or the Giants Chair in the south west corner of Snowdonia. Standing at 893 meters this beautiful crater like mountain will take your breath away with spectacular views out towards the Irish Sea and your final peak Snowdon. Standing at 1085 meters Snowdon is not only the finishing line for our Welsh 3 peaks Challenge it is also traditionally the final peak in the National Three Peaks challenge, being the highest point in Wales. 21:30 - Equipment Check and early to bed. 11:15 - Arrive at the base of Cadair Idris and begin trek. 13:45 - Summit of Cadair Idris. 15:15 - Complete Cadair Idris Trek and start drive to Snowdon. 21:00 - Complete Snowdon trek and let the celebrations begin!! **Please note that this itinerary can also be run in reverse. 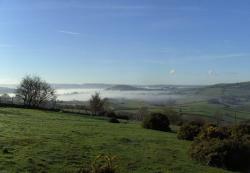 2 Nights Comfortable and clean bunkhouse accommodation is provided. Please remember to bring a towel. Warm bedding is usually provided, and we will confirm upon booking. What is a Level 3.5 Trekking Challenge Like? These challenges are either longer, higher, or span several days. In the case of single day events, you can expect up to 12 hours trekking. In the case of a multi day trek, you can expect lower daily durations - but of course - the effort is sustained over a longer period. You need to be keen on physical exercise for these events, and to enjoy taking exercise, and to do it regularly. Longer duration long haul treks are likely to be easier in terms of the physical walking, however, you will need to be more resilient - due to simple living conditions - ie using same clothes for several days, lack of washing facilities, simple food, and maybe camping - this forms an integral part of the challenge. How Fit Do I need to be to join a Level 3.5 ‘Trek’? You need to have good endurance for these events. You must be used to doing very long walks in the countryside - 7 hours + . You should be doing regular exercise - possibly with some running. Your running speed will be around 10-11 minute miling, and you should be able to run a minimum of 4 to five miles. If you do not run, you should be concentrating on other types of exercise - but for longer periods of time (i.e. sessions in excess of 1.5 hrs.) - these other forms of exercise should be at a moderate to high level. You should be used to walking reasonable distances each day to contemplate this trek. It requires stamina and good aerobic fitness - but good willpower will also come in handy! Failure to disclose medical conditions is a serious omission - that could have serious repercussions on any of our challenges. - Transport to either Brecon. - Transport back from Brecon. - Meals while on the Challenge. By nature all activities contain an element of risk.Your leader will be first aid qualified and will carry the appropriate safety kit for the activity, such as mountain safety shelters, walking rope and from time to time mobile radios. Safety equipment carried will be appropriate to trip. The leader's primary role is to ensure your safety, but it is your responsibility to listen to their guidance and instructions. The weather could go either way from warm temperatures to freezing cold – so be ready for anything – make sure you pack according to the list! Remember that layers are the key, allowing you to adjust your level of warmth more easily. We will almost certainly experience some rain during the weekend, so make sure you have suitable waterproof gear—both top and leggings.